A group attending the inaugural Cemetery Stories program in 2001. A cemetery is not the place most children expect to go for a field trip, yet last month we hosted 300 Geneva City School District students at Washington Street Cemetery. They were there to learn more about their community in our Cemetery Stories program. I have run this field trip for the last 17 years, currently with the help of retired Geneva teacher Diane Khouri. The program has been open to various elementary grades over the years. In its current form it is offered to second and fifth grades. 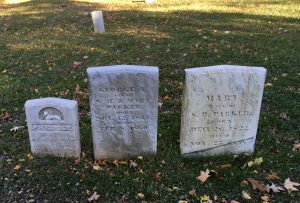 Our goal for the program is that the students will learn how to find historic information from cemetery stones. We also want them to recognize the value of cemeteries as historic places. 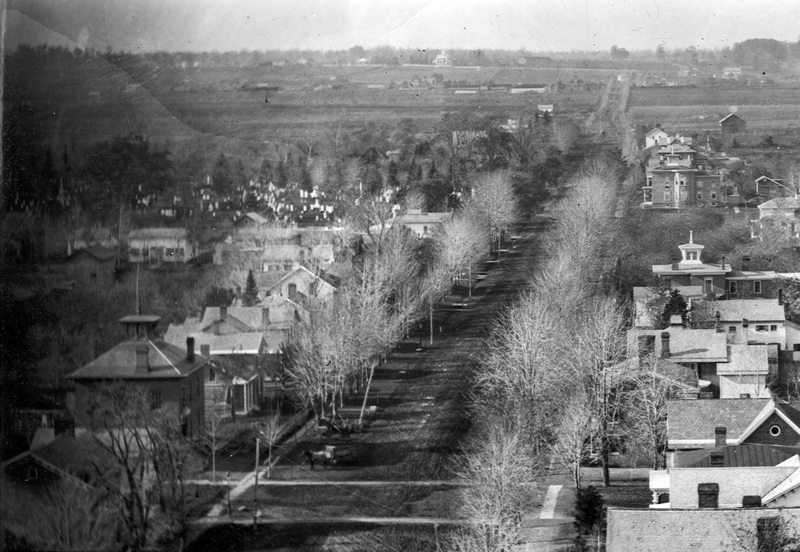 A view west down Washington Street showing the cemetery on the edge of town (upper left), c. 1880. New York’s second grade social studies curriculum focuses on the local community. 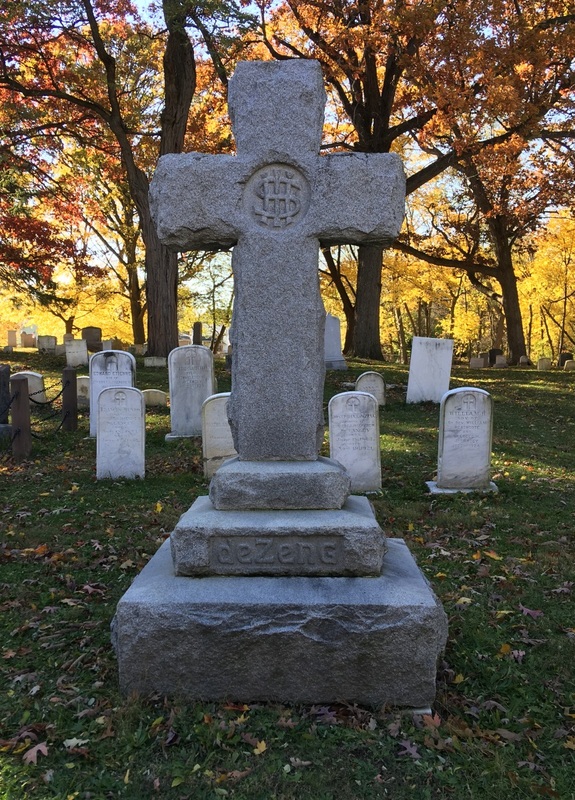 In Cemetery Stories, we help second graders see how the cemetery shows changes in the community over time. We also want them to learn that cemeteries are a place of respect and that every plot is connected to a family that once lived in their hometown. Photographs from our collection show the children that the burial ground was originally on the edge of town. Today it is much closer to the center of town than the edge. 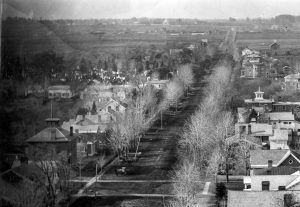 Until this year, second graders walked from nearby West Street School and could visually connect the 1880s images of Washington Street with the neighborhood they walked through. They can see how the city has changed and grown over time. The DeLancey monument is a favorite. Hint: those are three letters, NOT a dollar sign! One of the second graders’ favorite aspects of the program is always the search for symbols in the headstones. This ties in nicely with literacy objectives and their unit on citizenship and patriotic symbols. We can use a real, local place to reinforce the concept that images can stand in for words and ideas. 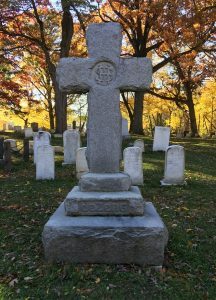 Through this exploration of symbols, students learn about the cemetery’s history as a Protestant Christian burial ground, and how religious diversity in the Geneva community has changed over time. They discover that a lamb carved on a stone is often a symbol for death in infancy. They learn that diseases they have never heard of once struck down children from families all over town with regularity. At the conclusion of their visit they work in groups to make a rubbing of a gravestone to take back to the school. This gives the teachers the opportunity to build further math or literacy lessons on the experience. 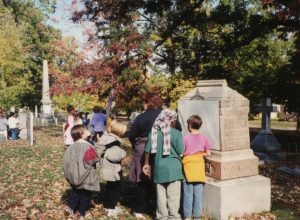 Most of these students then return three years later as fifth graders and do more complex explorations of the cemetery to achieve the same objectives. With this grade, our focus is on developing students’ reading and reasoning skills. My intent is to help the students learn to interpret the data on the stones and from a selection of primary sources to discover the story of a family. 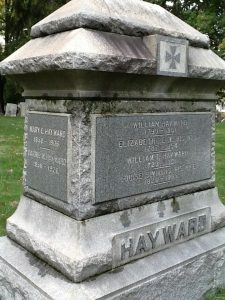 The Parker family plot at Washington Street Cemetery. 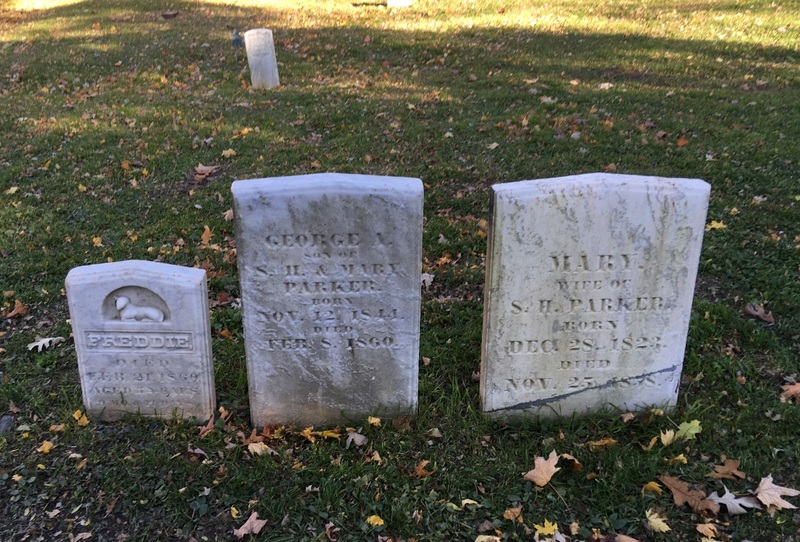 As a group we focus on one family plot, that of the wife and children of Stephen Parker, one time editor of the Geneva Gazette. We work through the stones there, using the information on them to make inferences about the three people buried in the plot and to try to determine their relationships. The students discover that the stones can reveal a lot, but leave them with more questions, such as how did these people die? Who did they leave behind? Where are other members of the family? We discuss evidence and how they can use primary sources to answer some of these questions. We look at census information, death notices, and Parker’s own Gazette for context. By the end of the lesson, the students have the outline of a story. They learn that evidence is limited and not all questions can be resolved in history. After this, they break into small groups and use their new skills to investigate other family plots to see what new stories and relationships they can find. The Hayward family is one of five plots fifth graders investigate on the Cemetery Stories field trip. Students seemed to understand that historians are a lot like detectives. They have to look at an array of sources to try and piece together a clear picture of a person’s life or of different events. They understood that you cannot grasp the full story by just analyzing a single source. Hearing how [Ms. Dealy] investigated several sources helped the kids understand it can sometimes be a long and challenging process. Historians persevere and work hard to gain answers; they do not always have immediate results. Students themselves have occasionally said that it was their favorite field trip and that they want to stay longer or look at more stones. Many of them are surprised to find out just how intriguing this local cemetery can be.